LACHLAN Lam, son of former Kumul halfback and coach Adrian Lam, was a surprise selection in Michael Marum’s 23-man World Cup squad announced yesterday in Port Moresby. Lam continues his family’s connection with Papua New Guinea rugby league. The 19-year-old five-eighth, who plays for the Sydney Roosters Under-20s in the Holden Cup, emulates his famous father who represented the country in 11 tests, captaining the Kumuls in 10 of them. The younger Lam is one of two newcomers in the squad with the other being SP Hunters lock Moses Meninga. Lam is one of the youngest players picked for PNG following in the footsteps of David Mead who first played as an 18-year-old under coach Adrian Lam and Marum at the 2008 World Cup. Coach Marum said he had been aware of young Lam because of his association with his father Adrian during his time under him in the Kumuls coaching staff. “I’ve been aware of Lachlan over the years since I’ve been with his dad Adrian when he was Kumul coach,” Marum said of the former Australian Junior Kangaroo. The side contains 10 SP Hunters players while England-based Gary Lo was the only Kingstone Press Championship player who made the squad. He makes his return to international football after a three-year absence. James Segeyaro returns to the side after last playing for a PNG representative side in 2013. Mead will captain the side while Ase Boas is his deputy. 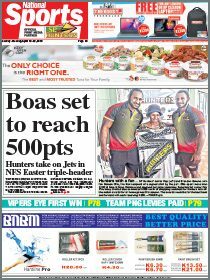 The Hunters players in the squad in clude Boas bothers Ase and Watson along with Wartovo Puara, Wellington Albert, Willie Minoga, Stargroth Amean, Nixon Put, Stanton Albert, Moses Meninga and Enoch Maki. In a blow for the Kumuls, South Sydney winger Alex Johnston was a last-minute withdrawal with coach Marum saying the 22-year-old’s club had advised him to miss the World Cup in order to recover fully from a hamstring tear suffered towards the end of the NRL season. “We were notified by Alex’s club that he was still in recovery and would not be available. They want him to get full y fit and put in a good preseason,” Marum said. The squad assembles in Port Moresby today for medical and fitness tests with the first training run tomorrow. The team leaves for Fiji next Wednesday for the Tri Nations series with Australia and Fiji at the ANZ Stadium in Suva on Oct 14. They return on Oct16 and have a short break before assembling into camp on Oct 20. 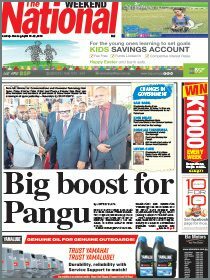 PNG play their first gamer on Oct 28 against Wales. The second match is a week later on Nov 5 against Ireland and the final home Pool C game is against USA on Nov 12. All games will be played at the Oil Search National Football Stadium in Port Moresby. Kumuls squad: David Mead ( Brisbane Broncos), Paul Aiton (Catalan Dragons), Ase Boas, Enock Maki, Moses Meninga, Nixon Put, Stanton Albert, Stargroth Amean, Wartovo Puara Jr, Wellington Albert, Watson Boas, Willie Minoga (PNG Hunters), Garry Lo (Sheffield Eagles), James Segeyaro (Cronulla Sharks), Justin Olam (Melbourne Storm), Kato Ottio, Kurt Baptiste (Canberra Raiders), Lachlan Lam (Sydney Roosters), Nene MacDonald (St. George Illawarra Dragons), Luke Page (Burleigh Bears), Rhys Martin, Rod Griffin (Canterbury Bulldogs), Thompson Teteh (Redcliffe Dolphins).